Landscapes are an important aspect of the appearance of your overall property and they also have an impact on the curb appeal of your home. The one way to ensure that they are as tastefully designed and planned as the interiors of your home is to hire professionals like the ones at Emerald Creek Landscapes, LLC for the job. We at are a well-established company in the landscaping field and have been serving customers in Ringgold, East Brainerd, and Fort Oglethorpe. Our experts have successfully completed a large number of landscape design and installation projects across East Ridge, Dalton, Chattanooga and Red Bank as well. We have also catered to customers in Middle Valley, Cleveland, Soddy-Daisy, Calhoun and the surrounding areas and created beautiful landscaping elements on their properties. 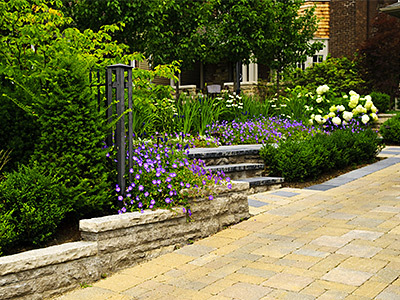 Hardscaping - These are all the masonry features of the property and include retaining walls, driveways walks, pathways, and sidewalks. The patio, curbing, edging, garden steps, fireplace, fire pit, and poolscaping are all part of the hardscapes. These features are installed in the first stage of the project and are the foundation on which the rest of the features will be built. Softscaping - This includes the plantings, trees, shrubs, hedges, lawns and flower beds. It’s important that these be chosen with care and installed expertly. We make sure to choose plants that have similar watering needs as this helps in planning the irrigation system well. Irrigation and Drainage - These are extremely important aspects of any project. Regardless of the size of the landscape, it will need a well-planned irrigation and drainage system. This will help in maintaining the health of the landscape’s plantings. Water Features - Most people like to get waterfalls, fountains, ponds or streams installed in their landscape. We can custom design these features for you and ensure their design and styling blends in well with all the other structures in the landscape. Fire Features - A fireplace or fire pit feature is a great addition to any residential outdoor space. The warmth it lends allows you to use these areas even when the weather is cold. Aside from all these aspects we also design and install outdoor lighting, patios, and outdoor kitchens etc. We have detailed discussions with you to understand what your specific requirements are and then provide solutions that are right in line with your needs. As a full-service local landscaping company, we tackle every aspect of design, planning, and installation so you are assured that the entire project will be completed in a seamless manner. We go the extra mile to provide custom landscape design and planning solutions and ensure that every feature we install adds to the value, functionality, and aesthetics of your landscape. With the vast experience and expertise we have developed over the years, we know what it takes to provide excellent solutions at very competitive landscaping cost. For any more information on our services or to discuss your project details, feel free to call Emerald Creek Landscapes, LLC at 423-593-5443. You can also send us your queries and project details via this online form.